Revel is one of our tastiest recipes, and is perfect for picky dogs. 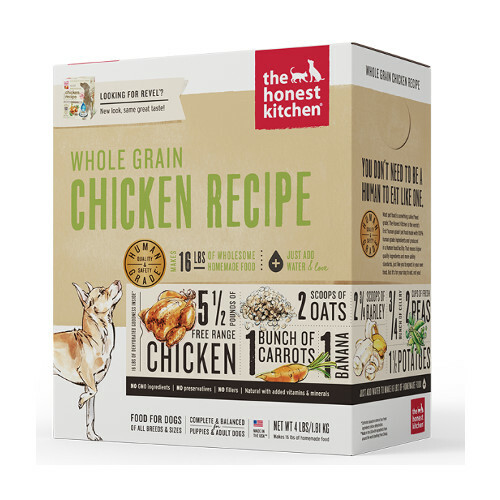 It’s made with dehydrated wholesome ingredients like free range chicken, organic barley, flaxseeds, carrots and bananas. Revel is a hearty new recipe from The Honest Kitchen, perfect for hounds on a budget! Revel is a human grade dog food that’s ideal for dogs of all life stages, including puppies, pregnancy and nursing as well as active adult dogs. Try a box today! All ingredients dehydrated: Free-range chicken, organic barley, potatoes, organic flax, organic oats, green peas, carrots, bananas, parsley, organic kelp, celery, tricalcium phosphate, choline chloride, zinc amino acid chelate, vitamin D3 supplement, vitamin E supplement, potassium iodide, potassium chloride, iron amino acid chelate, copper amino acid chelate, thiamine mononitrate.